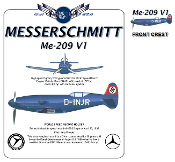 The Messerschmitt Me-209 V1 set a world speed record in the late 1930's that stood for 30 years Small crest on front, large design on back. One-sided design has large image on front, nothing on the back. Available as a T-shirt or a Sweatshirt. Available in White, Natural and Ash Grey.